Hello my name is Amanda Greenslade; I’m the managing director of Australian eBook Publisher. 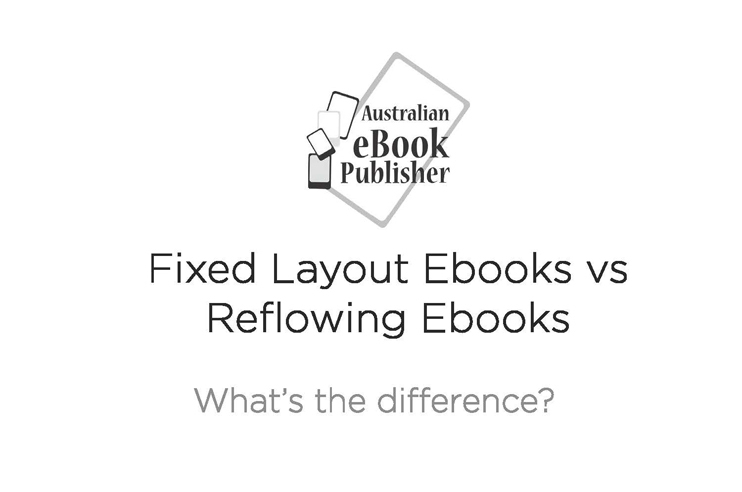 I’ve created this post to share with you my team’s expertise on fixed layout ebooks versus reflowing ebooks. Fixed layout is suitable for those jobs where you want to control the page layout no matter the device. If you already have a book in print you should have some PDF mock-ups or in positions from the printer. These are basically a ‘fixed layout’ because the layout or design does not move around no matter what device you read a book on. Advantages: the advantage with a fixed layout includes that the production of professional looking highly visual ebooks can be faster/cheaper if you already have a printed book designed. The fixed layout ebook version will appear to be the same as the printed version. The workflow and quality control therefore is simpler, because the designer and editor can do a visual comparison from print to ebook. Also in a fixed layout, you can control the page layout, meaning that you can design a new fixed layout ebook from scratch specifically for tablets, positioning everything and designing the text at the optimal size to reading on devices. There are different size devices; however, with different screen sizes, as well as different resolutions, consider engaging a professional team to find the right balance during the design phase. Disadvantages: distribution and device support for fixed layout ebooks varies; there’s no set standard like there is for reflowing epub. Sometimes the code used for a fixed layout for Apple iOS is not compatible with Android devices, and then when it comes to distribution on Amazon they have their own fixed layout format and software to create it. 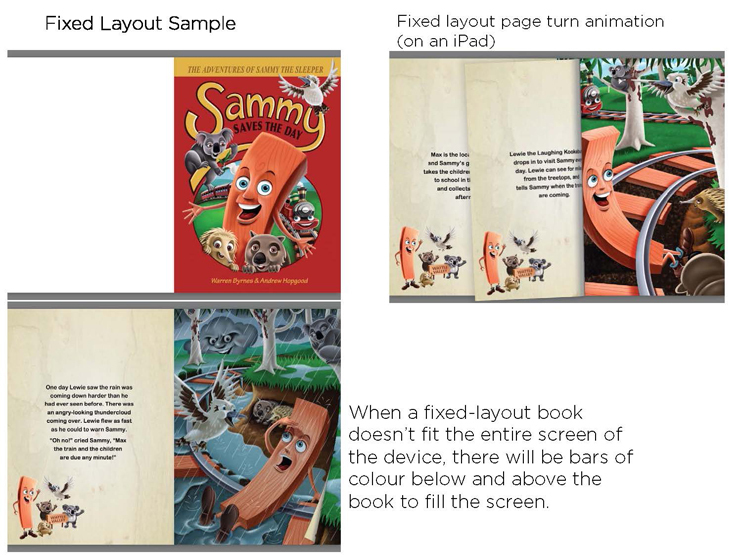 Apple also offers an Apple-only fixed layout format and software to create it called iBooks Author. With Android vendors like Kobo and Google Play we can usually release the Apple fixed Layout epub or slightly modified version of it. Barnes & Noble’s NOOK allow uploaded PDFs. Some books display differently depending on the zoom capability of the devices. This presents you with some challenges in assuring your fixed layout ebook is any good; you need to make sure it is legible and easy to use for your readers. The key is to test your fixed layout ebook on as many devices as possible, or engage a team like Australian eBook Publisher to do it. Reflowing simply means the person holding the device can adjust the amount of text that appears on screen. It is compatible with all e-reading devices and apps because the text reflows to fit the screen. Your book will be easy to use and read on mobile phones, dedicated e-readers like the Kindle Paperwhite and other e-ink e-readers, as well as small and large tablets. Advantages: the reader can adjust text size and double-tap to view images larger as long, as larger versions of the images are included in a book. Amazon’s format is .mobi, while .epub is the standard used by most other ebook vendors. 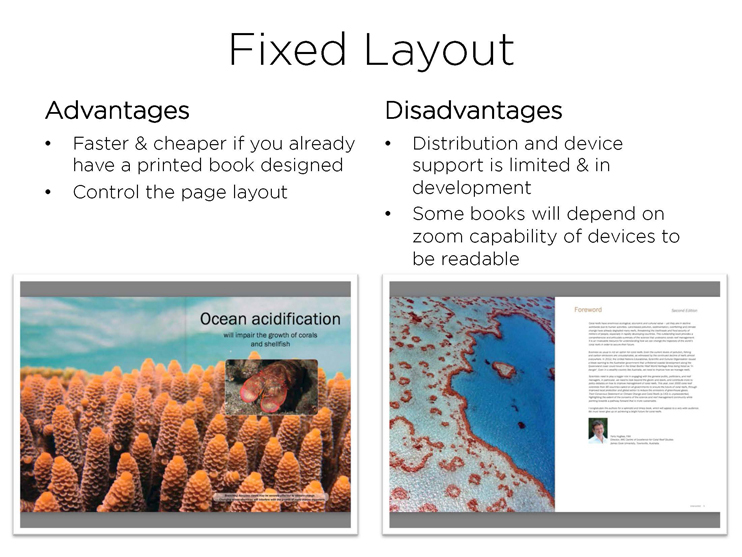 Disadvantages: the layout is more basic, although if you work with Australian eBook Publisher we have specialised skills in applying Ebook Designer’s Touch™ to your reflowing ebook to make it exciting and professional. Another disadvantage with reflowing is that hyphenation, widows, and orphans appear depending on the reader’s settings; fonts can be changed by the reader as well. Images should usually be set in between paragraphs, as it is difficult to achieve text wrap that will be any good on all devices. 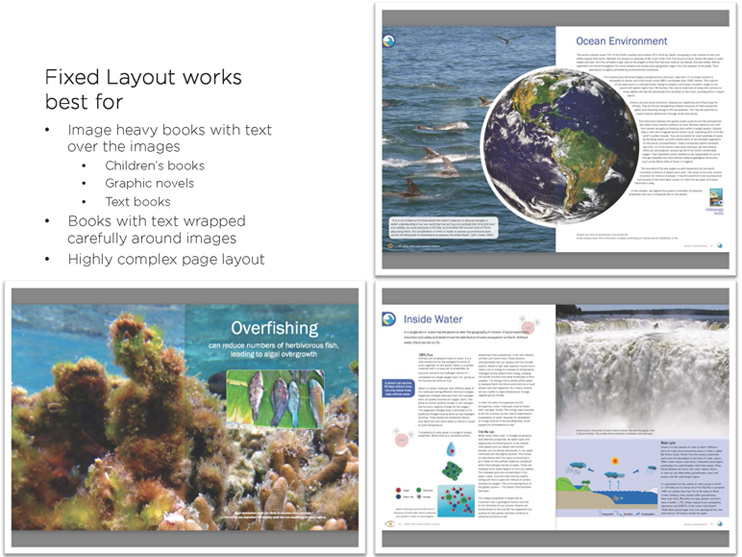 Fixed layout works best for image-heavy books with text over the images, like children’s books, graphic novels, textbooks with semantic use of design and layout, books with text wrapped carefully around Images, magazines, and highly complex page layout. 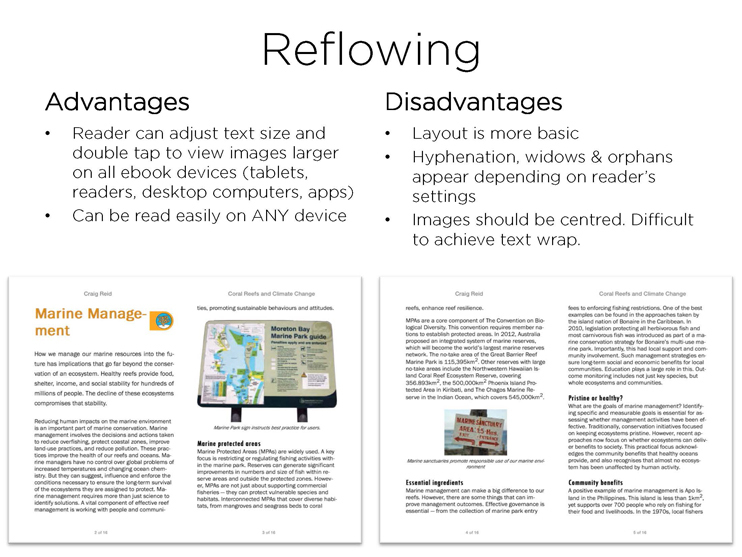 Reflowing works best for most books as long as you’re prepared to have a flexible understanding of the layout, as it will change from device to device and from app to app. 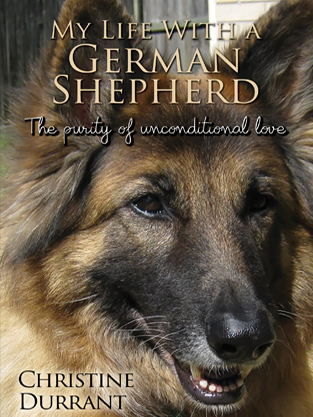 It is an especially good choice for novels, memoirs, reference books and any book with a lot of text. In the image above you can compare some pages from a book we converted to be fixed layout and reflowing. Both of these screenshots are from an Apple iPad; notice that the reflowing version on the right has a less appealing layout. It is easier to read as the text is larger. 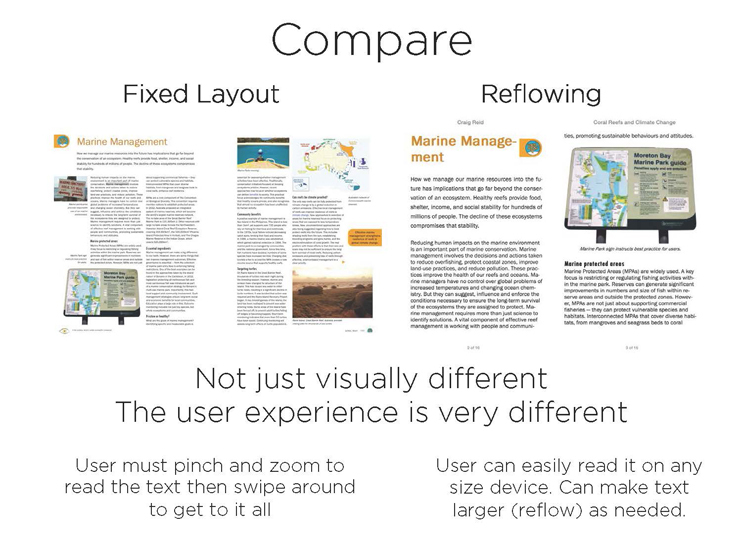 In order to read the fixed layout version, the reader has to pinch and zoom, then drag the finger around the page to keep reading each section of text, so fixed VS reflow is not just visually different, the user experience is very different. In a fixed layout, the user must pinch and zoom to read the text, then swipe around to get to it all. 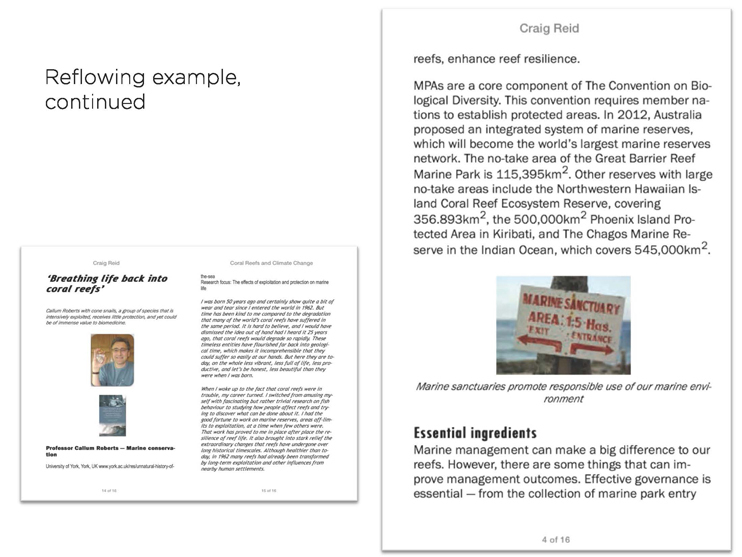 In a reflowing ebook the user can easily read it on any sized device. They can make text larger or smaller to suit them and it will reflow as needed. As you can imagine, the book above, viewed on a small device like a mobile phone, would be quite frustrating in fixed layout. The example the reflowing version of this ebook continues in the next image as you can see it is commonplace for widows and orphans to appear in a reflow. It’s just part of the format and not something that readers will be concerned about anymore. This may sound like a typesetter’s nightmare but actually it can be very liberating for a designer. Reflowing ebooks are a lot more like a website than a printed book. 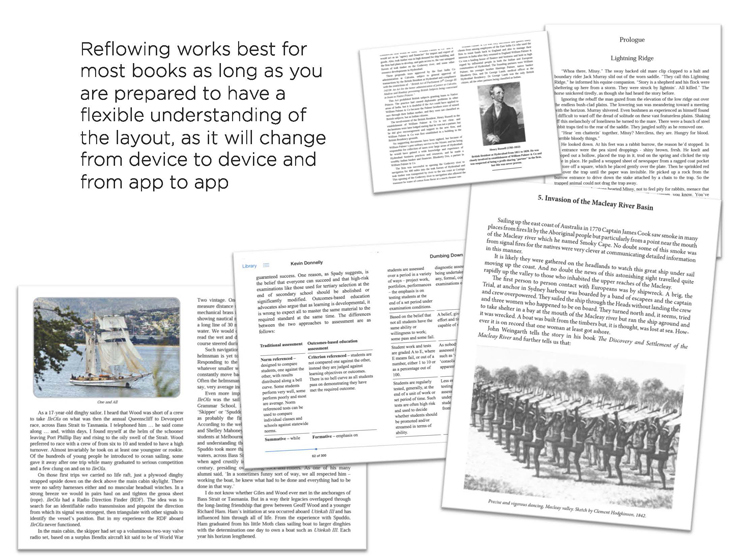 The image below is another example of a fixed layout ebook. We converted this from an existing print layout—the page size is not quite perfect for Apple iPad, which is why you see the grey lines at the top and bottom. It is actually difficult to make a fixed layout ebook that would fit perfectly on all the different types devices, and with this book in particular there might even be an advantage in keeping the gap at the top and bottom. This is because when you press once on your iPad, a menu will appear exactly where the grey segments are. With the menu visible, it effectively covers anything on the very top and bottom of the page. It’s good to use flexible thinking and design, not seek black-on-white rules. With ebooks, things are changing at a rapid pace, and it’s really up to you to try different things, test, and, if you want to design it yourself, track down a professional team to make your publishing journey as smooth as possible. Try to get hold of the spread PDF left and right page together, load this on to an Apple device to get an idea how it’ll look. You’ll find that PDF can be zoomed in a fairly limitless way. Fixed layout ebooks are a bit more limited. On Apple iPad you can view a spread, a single-page, and zoom in twice and have it hold there. The third zoom in requires you to hold your fingers on the screen. With Kindle devices it is not possible to zoom in, except on the latest Kindle Fire HD. You might be wondering why not to just use your PDF as an ebook, but you cannot distribute PDF through major ebooks vendors like Apple, Amazon, Kobo and Google Play. PDF is an Adobe format where as epub and mobi are more OpenType format that is easier for the publishing industry to share as a standard. Epub and mobi may be a lot less likely to hang on devices and PDAs, especially when it comes to larger ebooks and multimedia books.